We at Insider Monkey have gone over 700 13F filings that hedge funds and prominent investors are required to file by the SEC The 13F filings show the funds’ and investors’ portfolio positions as of September 30th. In this article, we look at what those funds think of United Rentals, Inc. (NYSE:URI) based on that data. United Rentals, Inc. (NYSE:URI) was in 48 hedge funds’ portfolios at the end of the third quarter of 2018. URI investors should be aware of an increase in activity from the world’s largest hedge funds lately. 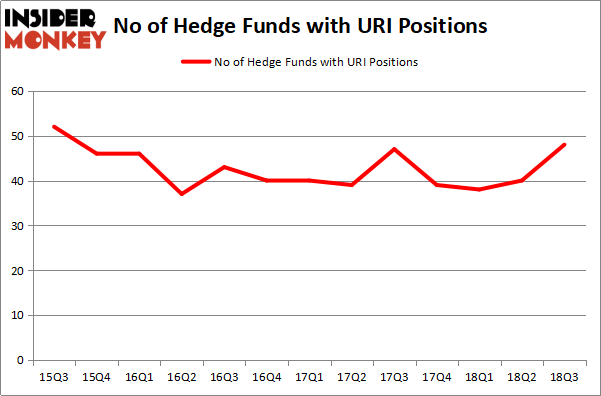 There were 40 hedge funds in our database with URI holdings at the end of the previous quarter. Our calculations also showed that URI isn’t among the 30 most popular stocks among hedge funds. To most market participants, hedge funds are perceived as slow, outdated financial vehicles of yesteryear. While there are more than 8000 funds trading at the moment, Our researchers hone in on the bigwigs of this group, around 700 funds. It is estimated that this group of investors manage the bulk of all hedge funds’ total asset base, and by following their inimitable equity investments, Insider Monkey has revealed various investment strategies that have historically beaten the market. Insider Monkey’s flagship hedge fund strategy beat the S&P 500 index by 6 percentage points a year since its inception in May 2014 through early November 2018. We were able to generate large returns even by identifying short candidates. Our portfolio of short stocks lost 24% since February 2017 (through December 3rd) even though the market was up nearly 23% during the same period. We just shared a list of 11 short targets in our latest quarterly update. Let’s check out the recent hedge fund action encompassing United Rentals, Inc. (NYSE:URI). What does the smart money think about United Rentals, Inc. (NYSE:URI)? Heading into the fourth quarter of 2018, a total of 48 of the hedge funds tracked by Insider Monkey were bullish on this stock, a change of 20% from the previous quarter. Below, you can check out the change in hedge fund sentiment towards URI over the last 13 quarters. With hedgies’ capital changing hands, there exists an “upper tier” of key hedge fund managers who were upping their holdings substantially (or already accumulated large positions). When looking at the institutional investors followed by Insider Monkey, Zach Schreiber’s Point State Capital has the largest position in United Rentals, Inc. (NYSE:URI), worth close to $169.5 million, amounting to 2.2% of its total 13F portfolio. 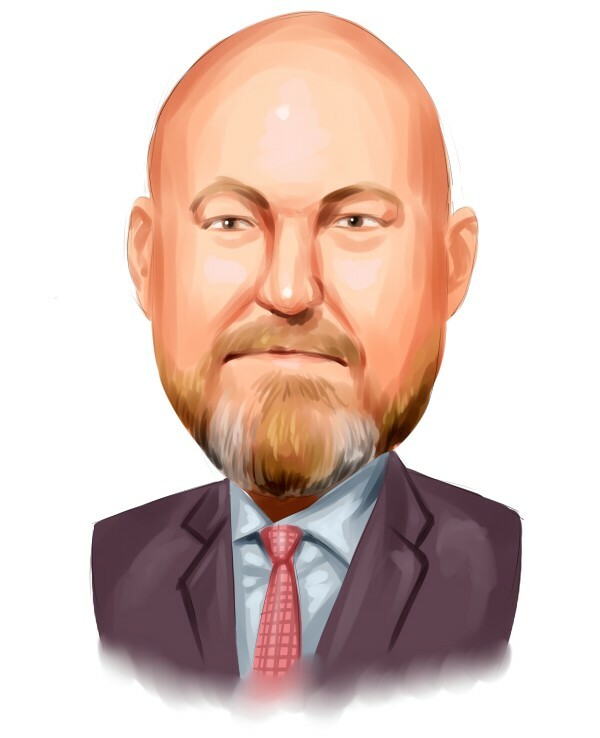 The second most bullish fund manager is Cliff Asness of AQR Capital Management, with a $163 million position; 0.2% of its 13F portfolio is allocated to the company. Remaining hedge funds and institutional investors with similar optimism comprise Ken Griffin’s Citadel Investment Group, Kevin D. Eng’s Columbus Hill Capital Management and Ken Heebner’s Capital Growth Management. Consequently, key money managers were leading the bulls’ herd. Point State Capital, managed by Zach Schreiber, established the most outsized position in United Rentals, Inc. (NYSE:URI). Point State Capital had $169.5 million invested in the company at the end of the quarter. Ken Heebner’s Capital Growth Management also made a $56 million investment in the stock during the quarter. The other funds with new positions in the stock are Clint Murray’s Lodge Hill Capital, Gregg Moskowitz’s Interval Partners, and Dmitry Balyasny’s Balyasny Asset Management. Let’s check out hedge fund activity in other stocks similar to United Rentals, Inc. (NYSE:URI). We will take a look at Eastman Chemical Company (NYSE:EMN), CDW Corporation (NASDAQ:CDW), Yum China Holdings, Inc. (NYSE:YUMC), and Raymond James Financial, Inc. (NYSE:RJF). This group of stocks’ market values are similar to URI’s market value. As you can see these stocks had an average of 27.5 hedge funds with bullish positions and the average amount invested in these stocks was $690 million. That figure was $1131 million in URI’s case. Raymond James Financial, Inc. (NYSE:RJF) is the most popular stock in this table. On the other hand, Eastman Chemical Company (NYSE:EMN) is the least popular one with only 25 bullish hedge fund positions. Compared to these stocks United Rentals, Inc. (NYSE:URI) is more popular among hedge funds. Considering that hedge funds are fond of this stock in relation to its market cap peers, it may be a good idea to analyze it in detail and potentially include it in your portfolio. Is PotlatchDeltic Corporation (PCH) A Good Stock To Buy? Hedge Fund Sentiment Is Stagnant On Portland General Electric Company (POR) Hedge Funds Are Dumping Gilead Sciences, Inc. (GILD) Is Motorcar Parts of America, Inc. (MPAA) A Good Stock To Buy? Hedge Funds Aren’t Crazy About FactSet Research Systems Inc. (NYSE:FDS... Is The PNC Financial Services Group, Inc. (PNC) A Good Stock To Buy?